Only on the sun, which is itself a 1027 ton self-contained nuclear explosion, would such a blast be considered puny. 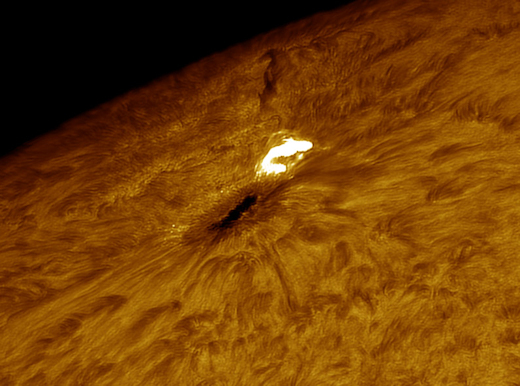 "Watching sunspot AR2738 and its B-class flares was like watching creation," says Wise, who also made an animation of the blast. "I used a Daystar Quark solar filter to safely take these pictures through my 8-inch Celestron telescope." The GOES X-ray flux shows continual decreased activity from AR2738, which is now flaring in the higher A range with only an occasional low B-class solar flare. including the B5.6 class flare, which peaked at 14:00 UT (08-Apr-2019). Former AR 2737 is near the west solar limb, and has shown little activity. 10MeV proton flux remained at background levels over the past 24 hours. reasonable chance of a C-class flare from AR 2738. 24 hours. The total magnetic field strength has fluctuated around 5.0 nT. The Bz component has been mainly negative, ranging between -7 and +5 nT. to be quiet to unsettled. TODAY'S ESTIMATED ISN : 012, BASED ON 19 STATIONS. AR2738 now has Beta magnetic configuration. a reasonable chance of a C-class flare from AR 2738.
conditions created by sporadic fluctuations in Bz and the solar wind speed. TODAY'S ESTIMATED ISN : 014, BASED ON 24 STATIONS. Bz component has fluctuated around 0 nT, ranging between -5 and +4 nT. TODAY'S ESTIMATED ISN : 013, BASED ON 23 STATIONS. On spaceweather.com, there are two articles dealing with this current solar minimum. Note that Beta AR2738 is gradually decaying. It now has an alpha magnetic configuration. 24 hours with a reasonable chance of a C-class flare from AR 2738. Bz component has fluctuated around 0 nT, ranging between -5 and +5 nT. TODAY'S ESTIMATED ISN : 015, BASED ON 17 STATIONS. NEWS: Is AR2738 Splitting in two? Explosion? The nature of light bridges is not fully understood. They often herald the break-up of a sunspot. Some research suggests that magnetic fields at the base of a light bridge are busy cross-crossing and reconnecting--the same explosive process that sparks solar flares. Does this mean sunspot AR2738 will explode--or quietly fall apart? No one can say. 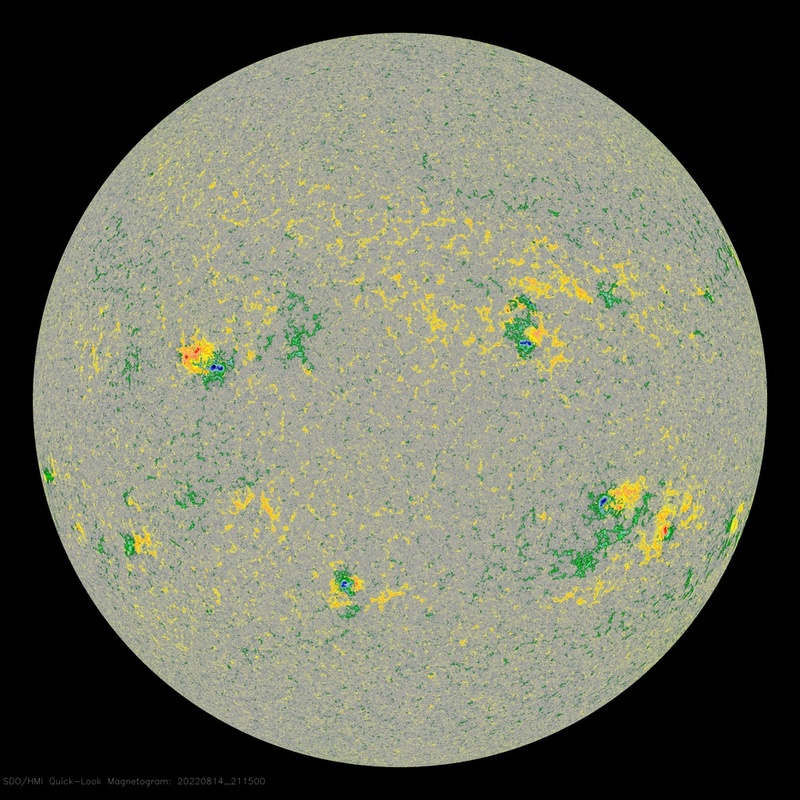 Readers with solar telescopes are encouraged to monitor developments. component has fluctuated around 0 nT, ranging between -2 and +3 nT. TODAY'S ESTIMATED ISN : 014, BASED ON 21 STATIONS. A NEW SUNSPOT: A new sunspot is growing in the sun's northern hemisphere. Provisionally numbered AR2739, the bipolar region has a magnetic polarity that identifies it as a member of old Solar Cycle 24. 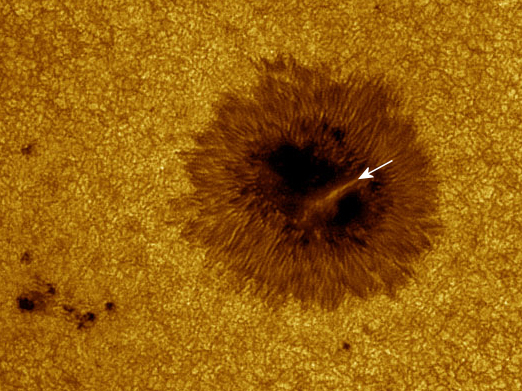 Old-cycle sunspots rarely produce strong flares, so the chance of flares remains low even as the sunspot number increases with the emergence of AR2739. This active region is trailing AR2738, which are both approaching the Western Limb where they will soon depart for perhaps another 13 to 14 day transit around the back side of the sun. 24 hours. The greater than 10 MeV proton flux was at nominal values. on an isolated unsettled interval. TODAY'S ESTIMATED ISN : 012, BASED ON 15 STATIONS.